Guided walk: 6.30pm to 7.30pm Tuesday 25 June 2013. Entry: £10, payable at the event. A sobering guided walk to admire some of Fitzrovia’s 40 or so public houses, many of which are architecturally striking. But what went on amongst the spit and the sawdust offers a different treat for the voyeurs of Fitzrovia life. 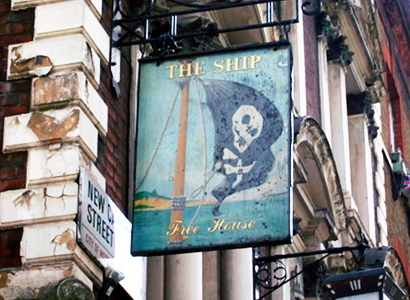 Partly-reformed boozer, historian of Fitzrovian deviancy and co-author of A Pub Crawl Through History, Mike Pentelow will reveal the depths of depravity that went on inside Fitzrovia’s pubs before the hipsters spoilt it all. If you are looking for Sodom and Gomorrah, you’ll find it here. A 60-minute walk: £10. Cash on the night. Maximum of 30 people. No children. Women at their own risk. Proceeds to charity. We aim to get around in 60 minutes, but could over-run by up to 30 minutes if there is a large number of people. This entry was posted in Uncategorized and tagged architecture, Fitzrovia, Fitzrovia Festival, guided walk, local history, London, public houses, pubs, urban exploration. Bookmark the permalink.